Brave (2012): Directed by Mark Andrews, Brenda Chapman, and Steve Purcell. Written by: Mark Andrews, Steve Purcell, Brenda Chapman and Irene Mecchi from a story by Brenda Chapman. Featuring the voices of: Kelly Macdonald, Billy Connolly and Emma Thompson. Rated PG for some scary action and rude humor. Running time: 93 minutes. Pixar has released its latest film, and that’s always (well, okay, unless it’s a new Cars movie) a cause for celebration. It stars a female protagonist—how refreshing!—and best of all, she’s got a pretty good movie to star in. Even by setting a new precedent for itself, Brave doesn’t rub the “girl power” theme in our face. Rather, it draws attention to her actions and words more than to the arbitrariness of her gender. Free-spirited and impulsive, but not without fear or insecurity, Merida (voiced by Kelly Macdonald) takes on her role of Scottish princess reluctantly—truth be told, she’d much rather be shooting arrows from horseback or climbing daunting cliff faces. If her trademark tangle of red hair is any indication, we’re not dealing with a traditional Disney princess here. Merida’s free-wheeling nature faces opposition, however, in the form of her mother Elinor (voiced by Emma Thompson). Elinor fills a role we’ve seen time and time again—she believes firmly in tradition, reminding Merida of the ways of a princess, and disapproves of “unladylike” behavior. Here Brave risks veering into generic territory, and sometimes does—but not without a certain level of sincerity. “I want my freedom!” she desperately tells her mother. “But are you willing to pay the price your freedom will cost?” Elinor retorts, not unkindly, but out of love. But when the lords arrive for Merida’s betrothal, tempers flare between the pair, and Merida runs away in frustration. Lost and confused, she follows a mysterious trail of will o’ wisps to a witch’s hut, and finds she might be able to change her mother’s mind (for a price of course). The coming-of-age story that follows runs the gamut from generic montages to genuine moments of growth and development. I have talked with people about the film and notice how many find the material “too safe” considering Pixar’s reputation. And while I agree to a certain extent, I believe the film lives up to its title, usually in small and subtle ways. There is the simple pleasure of the wisps as they gently sigh and disappear into the landscape, or the fearsomeness of the dread bear Mor’du, which is probably the most terrifying thing Pixar has ever animated. Potent voice acting also lends authenticity to familiar proceedings. There’s strong work here from Billy Connolly and Emma Thompson, but the true star is Kelly Macdonald. A native Scotswoman, Maconald brings local flavor and a level of gravitas to her role that no animated character has any right to possess. And the story follows familiar beats but manages some small alterations. The witch doesn’t goad Merida into taking a spell—that’s all of Merida’s pushiness. And think about it—when was the last time we saw a film about a mother-daughter relationship, conveyed with such an even hand? An early scene skillfully cross-cuts an imaginary dialogue between Merida and Elinor about the betrothal ceremony, and we’re shown that while each woman doesn’t agree with the other, they know full well the arguments of the other side. And in the course of the film, they both validate their own identities and learn to incorporate elements of the other. 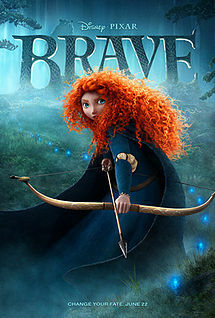 Make no mistake; Brave is undeniably Pixar. It is the work of a studio that still holds a tight rein on digital animated film, with a commitment to quality animation that is more than just a gimmick to coax the family audience. And though Brave may not touch some of Pixar’s finer work, it nonetheless continues to explore new territory for animated storytelling.